Find properties currently for sale or lease in your desired location. Also view properties currently for sale or lease with The Glenn Team. Residing in one of the best buildings in the Yonge and Eglinton area, this 2 + 1 Bedroom, 2 Bathroom condominium comes in just shy of 850 square feet, with a large 126 square foot private terrace. Though this area is bustling with development, this suite will keep your life calm, quite and secluded above the buildings expansive courtyard. The amenities on-site are second to none: large indoor swimming pool, 2-level fitness centre, 24 hour concierge and the convenience of Loblaws and the LCBO just an elevator ride away. High ceilings and modern finishes give this suite an expansive and open feeling. Perfect for a young couple, new family or empty nesters needing some well deserved peace and quiet. Come and see it before it’s gone! Absolutely spectacular lake and city views await. Watch idyllic sunrises and sunsets from your luxurious, trendy 2+1 bedroom, 2 bath condo. Almost 1000 Sq Ft. upgraded with hardwood floors, beautiful open kitchen, quartz counters, large island & stainless steel appliances. barn doors & high ceilings create an edgy, loft look. Enjoy outdoor living on the large balcony w/ cedar floors. Great neighbourhood with convenient streetcar & subway access, schools, parks, great shops and restaurants. Enjoy nearby parks (Wichwood Barns, West Hills), ice cream at famous Dutch Dreams & Booyah, convenient grocery shopping at Loblaws, Joe Fresh & local stores & amazing restaurants. In house amenities include 24 Hour concierge, pool, sauna, gym, media room, party room and more! Where else in Toronto can you get a lake views from Scarborough to Oakville? Why look elsewhere? You've found your new home! Come see it before it's gone. Contact us today to book an appointment! Come see it quickly before it's gone! Contact us here to set up a viewing. *please note that some photos are of the duplicate unit upstairs to get an idea of what can fit in the space. Sleek and style modernity in Corso-Italia. This large and very beautifully decorated upper-level, stacked townhouse has everything the first time home-buyer, new family or down-sizer could want. Stylish and impressive features throughout including; 9 foot ceilings, high-sheen, white cabinets and backsplash, marble countertops, dining room light fixture and laminate floors throughout. An amazing walk-score of 94 which includes access to the St. Clair streetcar steps away, Earlscourt Park, pool and JJP community centre, and all of the amazing shops and restaurants Corso-Italia has to offer. What are you waiting for?! Come grab this piece of real estate heaven before it's gone! Step into one of Toronto's hottest downtown residences. Steps away from everything the city has to offer, this TIFF Festival Tower suite features absolutely stunning one-of-a-kind views of the city in a spacious and stylish open concept design. This 1250 square foot suite has the best layout in the building. Features include an upgraded Miele stainless steel kitchen, 9 ft. ceilings, a Control 4 home automation and security system and rich dark hardwoods throughout. Bright and spacious, the entire suite is modern and sleek to accommodate the young professional, down-sizer or new family. The master suite and 2nd bedroom offer views just as breathtaking and scenic as the principle rooms, with ample closet space and ensuite baths. Take a relaxing swim while overlooking more grand cityscapes or a steamy sauna after your workout in the building's gym. Enjoy a good book or film in the media lounge or just play a quick game of pool over drinks in the lounge. The Bell TIFF Lightbox and some of Toronto's best cinema is only a minute away, and it's a short walk to countless restaurants & theatres, the Toronto Opera House, Roy Thompson Hall, The Rogers Center and so much more! Semi-Detatched Elegance in a beautifully renovated Davisville Village house. No surface left unturned. This gorgeous 2 Bedroom, 3 Bathroom House is ready to move in! CONTACT US TODAY TO LEARN HOW YOU CAN EARN MORE FOR YOUR PROPERTY! This detached, 4 bedroom Rosedale home offers the perfect mix of classic charm and modern design at an ideal location in the central core. A landmark home in the midst of Rosedale, this beautiful home was built at the turn of the last century, circa 1900, and evokes all the charm, splendour and craftsmanship of that era. A classic centre hall plan, it sits on a magnificent 75 ft. x 150 ft. lot with a private drive and detached garage. This 5 Bedroom has been graciously updated over the years with new state-of-the-art, contemporary Bulthaupt Kitchen, designer finishes and mechanicals. 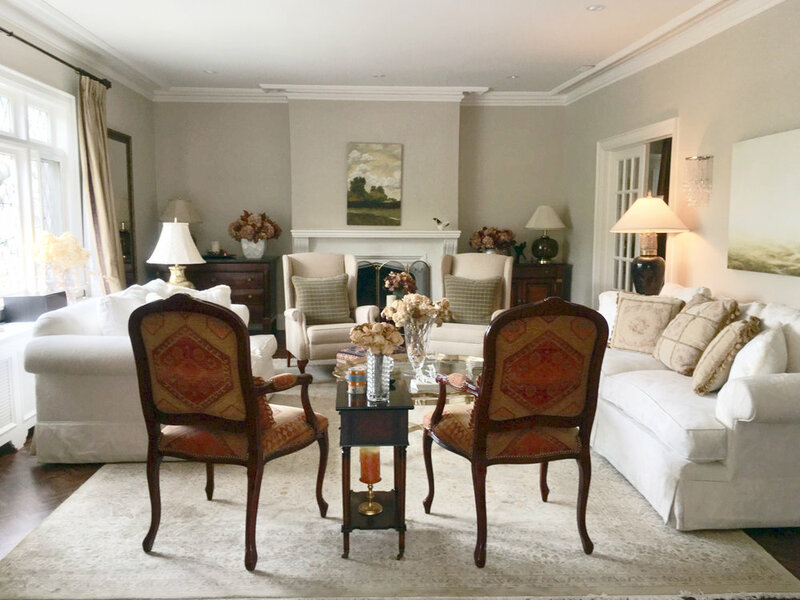 The elegance and character have been retained with beautiful hardwood floors, coffered ceilings, mouldings, and large and gracious principal rooms. For more information or to make an appointment to view this magnificent home, please contact us. One of the grand dames of Yorkville, The Renaissance Plaza offers exceptional value in an unbelievable location at Cumberland and Avenue Rd. At $1,199,000, 1700 square feet, with spacious principal rooms, 2 large bedrooms and 2 full baths, this condo is a steal at half the price per square foot of comparable new condos in Yorkville. The Renaissance Plaza will soon be seeing a facelift once again making it one of the most desirable buildings in Yorkville. 24 hour concierge and valet service offer wake up calls, delivery service of groceries, packages and laundry, parking and retrieving your car, and more. Other amenities include indoor pool, rooftop garden and deck, fitness facility, sauna and squash courts. Create your own vision in this wonderful suite overlooking the Yorkville Parkette with unobstructed views of Yorkville and surrounding areas. Enjoy the lifestyle of Yorkville and the Mink Mile with shops, restaurants and transit at your doorstep. Yorkville is the hottest area in the city. CONTACT THE GLENN TEAM FOR MORE INFO. Elegance and charm greet you in this gorgeous 3rd floor, 2 +1 bedroom apartment in Rosedale. Short walks to shopping, Bloor St. and all the best Rosedale has to offer. Available short or long term. Contact Susan or Jeremy for more information. This stunning penthouse atop The Hazelton Hotel and Private Residences in Yorkville, Toronto occupies the entire 9th floor. This remarkable penthouse offers over 7600 sq. feet of elegance with approximate 5700 sq. feet of terraces and 360 degree views of the city. With countless features and amenities, this penthouse is truly one-of-a-kind in the Toronto luxury real estate landscape. Contact Susan Glenn or Jeremy Glenn to get more information or book a showing of this amazing property. The Glenn Team comprised of Susan Glenn and Jeremy Glenn; sales representatives with Chestnut Park Real Estate Limited, Brokerage. Susan Glenn has been a real estate professional for over 25 years. Jeremy Glenn has a strong background in marketing and sales. Their affiliation with Christie's International helps The Glenn Team retain the ultimate in luxury real estate and stay apprised of what's happening in luxury real estate markets world-wide. SIGN UP FOR OUR NEWSLETTER & MARKET REPORT! Our Market Reports provide monthly analysis on the Toronto Housing Market, with specific pricing information on YOUR neighbourhood. Our Newsletter keeps you up to date on everything hot in the Toronto housing market.